This is a Forbearance Agreement that is applicable only in the Minnesota, A forbearance agreement is used to postpone a foreclosure bough upon the property of the borrower by the lender on the instance of the borrower not having paid back the loan of money in the time allotted. If both the Borrower and the Lender agree to the terms set in the agreement the foreclosure can be pushed ahead for a certain number of days so the Borrower can pay back the dues and not lose his property. The date of the original loan agreement has to be mentioned on this forbearance agreement along with the original principal amount in US dollars and a promissory note that is attached with the original loan agreement. The date of the guaranty executed by each guarantor, along with a copy of that guaranty. 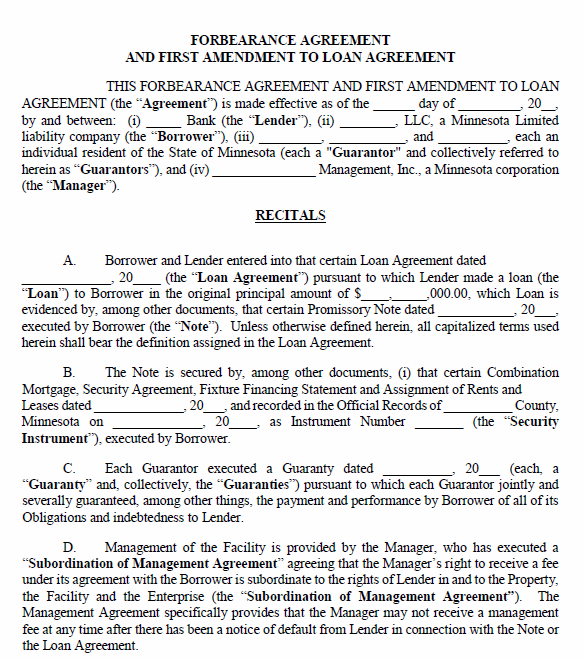 All the documents along with the loan agreement, the note, the security instrument, the guaranty is, the subordination of management agreement and any and all of the documents related to the loan including any renewals, extensions and amendments should be attached with this Minnesota forbearance agreement. It is noted that the borrower has failed to comply with a promissory note in making payments you on the mentioned dates and is therefore fail to comply with the terms set forth in the original loan agreement. Because of such failure the lender has decided to foreclose on the property which was given as collateral/security deposit. It is noted in this document that the borrower has requested that the lender temporarily forbear from foreclosing on his property. And that at the borrower’s request the lender has agreed to push forward the date foreclosing to a later date agreed upon by both parties. You can modify the contents of this document to suit your needs, you can easily download this Minnesota Forbearance Agreement template by clicking on the download link below. Concerning an attorney is always advised before signing any legal documents.